Room 101 is a TV show on British national television from BBC1 with an average rating of 3.3 stars by TelevisionCatchUp.co.uk's visitors. We have 242 episodes of Room 101 in our archive. 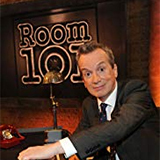 The first episode of Room 101 was broadcast in April, 2019. Did you miss an episode of Room 101 but don't you wan't that to happen in the future? Please set an alarm and add Room 101 to your favourites, so we can remind you by email when there's a new episode available to watch. For free! Frank Skinner invites Bill Bailey, Una Stubbs and Alice Levine to share their pet hates, including taramasalata, people who talk too loudly and drama cliches. Frank Skinner invites Katherine Ryan, Geri Horner and Adam Buxton to share their gripes, which include phone calls, pens that fail to work properly and marathons. Stephen Mangan, Phil Wang and Holly Walsh discuss their pet hates, which include The Archers, having a bath and being friendly with an aerobics instructor. Frank Skinner invites Roisin Conaty, Chris Kamara and Nish Kumar to share their personal gripes, which include bread at restaurants, downloading music and ex-partners. New. Stephen Mangan, Phil Wang and Holly Walsh discuss their pet hates, which include The Archers, having a bath and being friendly with an aerobics instructor. New. Frank Skinner invites Roisin Conaty, Chris Kamara and Nish Kumar to share their personal gripes, which include bread at restaurants, downloading music and ex-partners. New. Frank Skinner invites Vicky McClure, Sandi Toksvig and Josh Widdicombe to express personal gripes that include real ale, hotel leaflets and coat hangers. New. Comedian Jimmy Carr, writer Steven Moffat and singer Rochelle Humes express gripes including sandy beaches, other people's opinions and being Scottish.